The rock of Abraham and Isaac, in the middle of the Temple Mount, is today under the Dome of the Rock. This rock is the focus of all the desires to renew the Temple and the campaign of Israel to return to the Temple Mount and to reintroduce godly worship on this holy site. The rock is the most interesting and attractive place on the Temple Mount. The location of the Holy of Holies, the most holy place on earth, is very close on the western side of the rock. These very holy locations are at the focus of the campaign of the Temple Mount and Land of Israel Faithful Movement. According to Jewish heritage, G-d made this rock the foundation of all the earth. According to this tradition, this was the site of the Garden of Eden. It was to this rock that G-d sent Abraham to sacrifice his son, Isaac, 4,000 years ago when G-d spoke to Abraham saying; 'Take now thy son, thine only son Isaac, whom thou lovest, and get thee into the land of Moriah; and offer him there for a burnt offering upon one of the mountains which I will tell thee of" (Genesis 22:2) When Abraham immediately obeyed G-d and took his son to this rock to sacrifice him he proved his loyalty to his Creator. It was thanks to this act that G-d's choice of him and his seed was confirmed. By this act, Mt. Moriah became the most holy place on earth and the place for the worship of G-d.
Later King David liberated the Temple Mount and Jerusalem from the Jebusites. He also bought the place from Arauna the Jebusite. Why did he need to buy a place which G-d had promised and given for ever to the people of Israel? The answer is that three places in the land of Israel were bought by the people of Israel even though the land had been promised by G-d because when nations come and say: "this land does not belong to you. ", the answer to them will be: "This land was given to us by G-d Who is the owner of all the universe, and we also paid for those three places which symbolize this land." These three places are the Temple Mount, The Machpelah cave of the Patriarchs in Hebron and the Tomb of Joseph in Shechem. King David built an altar and made a thanksgiving sacrifice on this rock. His son, King Solomon, built the First Temple, on this rock, 3,000 years ago. The rock became the place of sacrifice in the First and Second Temples when the altar was built on the rock. After the destruction of the Second Temple in 70 CE, when the people of Israel were taken into exile by their enemies, the Temple Mount and the rock of Abraham became a place of foreign pagan worship up until the present time. Since the destruction of the Second Temple there have been two streams of thought about the purpose of the rock in the Temple. The one is that it was the site of the altar of sacrifice, the other is that it was the site of the Holy of Holies. After the Six Days War in 1967, the chief Rabbi of the Israeli army, Rabbi Shlomo Goren, brought a unit of engineers to the Temple Mount and they measured all the site according to the dimensions which the Bible and Talmud give and their conclusion was very dearly that the rock was the site of the altar which was in front of the Holy of Holies. Today the rock exists as it was in the Biblical times. This is the highest point on the Temple Mount. Under the rock is a tunnel and steps which lead to a cave. This cave is called the Cave of the Spirits because the air came up from this cave to the altar and allowed them to keep the fire burning permanently on the altar. The cave is very beautiful. From the cave a tunnel leads off to the east. However it is blocked by a door of stone. It is thought behind the door there is a tunnel which leads to a secret chamber where the Ark of the Covenant was hidden. It will be such an exciting day when, G-d willing very soon, the people of Israel will come back to the Temple Mount, purify it from foreign worship, and start to build the Third Temple. The door in the cave, and others, will be opened and the Ark of the Covenant and other very holy vessels will be discovered and again placed in the Holy of Holies and the Temple. This will happen in our lifetime. G-d is ready. Now it depends on us. Let us show Him that we are ready and determined and with devotion to act for this. Over the centuries many researchers and other Israelis have tried to locate the vessels which the Romans robbed from the Second Temple and carried to Rome in the year 70 CE. The conclusion of all of them has been that the holy vessels were hidden in the underground vaults of the Vatican. A few of those who have visited the Vatican have, in previous centuries, reported seeing some of the vessels including holy vessels which were brought to Rome by the Jewish prisoners and which were used by the Jewish community in Rome. One example of this is a number Sefer Torah scrolls. Our Movement is going to send a letter to the Pope requesting him to immediately return all the holy vessels to Israel. The message will be: the G-d of Israel redeemed the people of Israel and brought us back to the Temple Mount, Jerusalem, and to the Promised Land; G-d willing, in a short time the Third Temple is going to be built in Jerusalem and the vessels must return to the place where G-d decreed them to be. In the past the Roman Catholic Church has refused to agree to this request and has even denied the existence of the vessels in the Vatican. But who are they to attempt to stop G-d from fulfilling His plans to redeem His people. We advise the Pope to immediately send the vessels of his own free will; otherwise G-d will "help" him to do so. One of the most incredible and mysterious historical facts is the fact that the Jewish nation has never given up its deep linkage with the Temple Mount. There were times that foreign powers which occupied Jerusalem did not allow the Jews to go up to the Temple Mount or even live in Jerusalem. But under other foreign rulers the Jews were sometimes allowed these rights. It is very well known to the historians that in the first centuries after the destruction, Jews continued to sacrifice to the honor of G-d private sacrifices which can be sacrificed without the Temple. They simply built an altar and performed the sacrifice with a priest. In the same way we know that synagogues existed on the Temple Mount until the early Sixteenth Century. When the Moslems occupied Jerusalem in 638 they found a synagogue at the southern end of the Temple Mount dose to the Hulda gates. Initially the Moslems returned control of the Temple Mount to the Jews. After a few decades, however, the Moslems destroyed the synagogue and the last remains of the Temple and built the Al Aqsa mosque on the site of the synagogue and the Dome of the Rock on the location of the Temple. 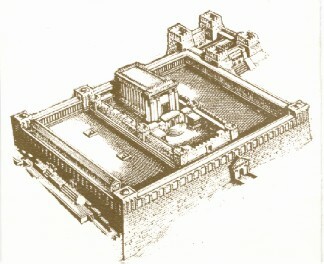 Later another synagogue was built near the Western wall of the Temple Mount close to the location of the Temple. Jews prayed in these synagogues until the early Sixteenth Century. At this time the Islamic Ottoman empire forbade them to pray in the synagogues and destroyed them. They sent the Jews to pray near the Western Wall and the history of this wall as a temporary place of prayer and a bridge to the Temple started at this time. A few years ago the executive of our Movement met the then Chief Rabbi of Israel, Rabbi Mordechai Eliyahu, and he stated that a synagogue must immediately be built on the eastern side of the Temple Mount which would face the Holy of Holies with a glass wall and would be higher than the mosques. But we knew then and even more so now, that at this time of redemption of the people of Israel only the Temple must be built on the Temple Mount. Synagogues were built on the Temple Mount in time of exile when we could not build the Temple. But now, in this time of redemption of Israel, G-d is expecting us to build the Third Temple. Conferences and Lectures * Donations * Archeology * Please Note!